Dr. Siddiqi was born in Karachi, Pakistan. He came to the United States in his teen years with his family and graduated from the Bronx High School of Science, Bronx, NY. Then he got his bachelor's degree from Harvard and Ph.D. at Yale where he worked on superconducting qubits, also written as q-bits. Dr. Siddiqi has been teaching at UC Berkeley since 2006. "For me, any quantum technology, including quantum computing, is something that takes advantage of entanglement. And entanglement is the idea that if you have different pieces of matter and you put them together, they behave as a single unit. So, for example, each of the bits in a classical computer are independent of each other. If you flip one, it doesn't affect the one next to it. In a quantum computers all of these bits have correlation with each other so they're all tied together like one big mass. In fact, the number of states that they can occupy is exponentially larger because of these linkages between neighboring elements. Quantum computing is the science of manipulating this entangled set of bits for some particular problem of interest in either fundamental science and computation or to do a simulation of the natural world." Top American tech companies are racing to build a new generation of powerful quantum computers backed by $1.3 billion commitment from US Congress to help them compete with the Chinese. Advanced quantum computing power will likely have many defense and intelligence applications like decrypting computer coded messages. Potential civilian applications include new drug discovery and artificial intelligence. 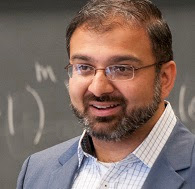 Dr. Irfan Siddiqui is a Karachi-born Pakistani-American scientist engaged in leading edge research in quantum computing. He's part of the increasingly diverse technology workforce of Silicon Valley, California where immigrants from many emerging economies such as India, Pakistan and China are helping define the future.